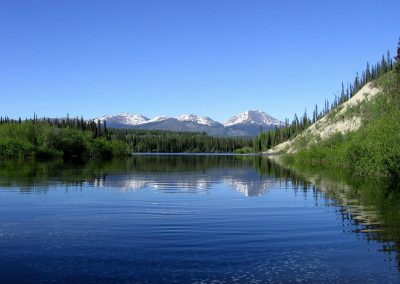 The Teslin River, located in the southwest of the Yukon Territory, flows through one of the most scenic areas of the Yukon. 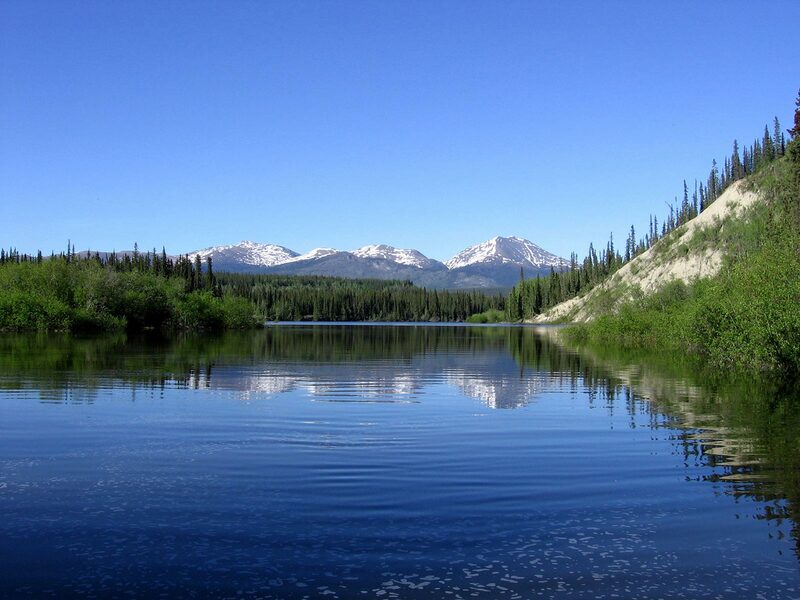 The Teslin offers everything you can expect on a beautiful canoe trip. Quiet running water and a varied river course. Sometimes the river is wider and in other places it winds its way as a small chanal through a swampy landscape. 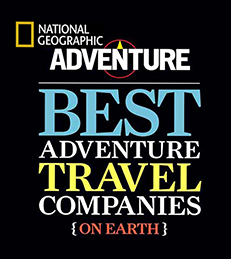 This diversity invites you to explore and allow us to observe moose, beavers, bald eagles and, with some luck, black and grizzly bears close up. Unique camps with good fishing possibilities make us forget the everyday life, in the evening camp fire. 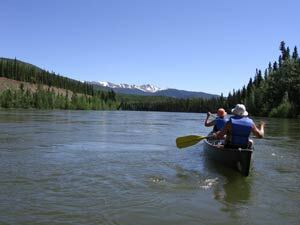 The Teslin River is also easy to master by inexperienced paddlers and is the ideal river to enjoy the Yukon and its wildlife in harmony with nature. At the time of the big gold rush, the Teslin was used as an alternative route to the Yukon River, on the way to the Klondike goldfields at Dawson City. Away from civilization and in the middle of the wilderness, we follow these traces. From Johnson’s Crossing to Dawson City, past abandoned settlements, trapper cabins and old paddle whealers, we enjoy the beautiful scenery of the Yukon. Again and again, we come across remains from the past. At Hootalinqua, after about 195 km, we meet the mighty Yukon River, where we continue our canoe tour. A trip to the streamer “SS Evelyn” at Shipyard Island and panning for gold at “Cyr’s gold dredge” puts us back into the gold rush era. After passing through the notorious Five Finger Rapids, we reach the historic village “Fort Selkirk” in the following days of the canoe trip. The next days we will enjoy the endless wilderness in our canoe, before we reach the Klondike gold fields and Dawson City. We will stay for the next two days in Dawson. In the city, where around 100 years ago everything was dominated by gold, we will visit an active gold mine at Hunker Creek and dig in the river for gold nuggets. In the evening we visit the legendary Diamond Tooth Gerties Casino. By black jack, poker or roulette, we can enjoy the Can Can Show. The visit of the historic gold dredge “Dredge No.4” and a detour to the “Discovery Claim” at Bonanza Creek concludes our adventure tour. Our canoeing adventure begins on the Teslin River with a short drive along the Alaska Highway southeast to Johnson’s Crossing, where we start our canoe trip with a short stretch before we reach our fisrt camp on the shore of the Teslin River. 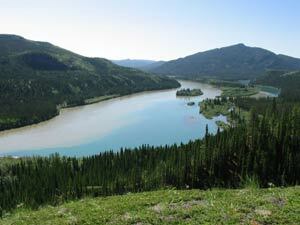 At the beginning the Teslin is a wide river and flows along a grassy swampland. After several kilometers the Teslin is getting smaller and we feel how the current is getting faster. Nestled into the hills, the Teslin now flows briskly through wooded valleys. In this area we will find some nice camps and have the opportunity to explore some of the old trapper cabins or go for a short hike on the nearby slopes. While canoeing we have enough time to try out our fishing skills as a freshly caught fish is a welcome supplement to our menu. In the early summer months we might see some moose cows and their calvs on the islands which characterize the Teslin River. 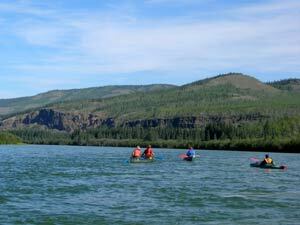 Bald eagles are nesting in the trees along the river and even bears have been observed several times on our tours. In Hootalingua, the Teslin merges with the Yukon River where we continue our canoe trip. After about 380 km on the Teslin and Yukon River we will join civilization in Carmacks for the first time again and top up our supplies. This is our half way point to Dawson City. The second half of our trip to Dawson City leads us again past old settlements, trapper cabins and trading post stations for the paddle wheelers. A tour highlight is our camp at the remote Fort Selkirk at the confluence from the Pelly in the Yukon River. While exploring the former settlement we will gain the best impression of the pioneer life during the middle of the last century until the settlement was abandoned in the 1950s. Your guide will tell you about the old days and the new days of the Gold rush while we are sitting at the campfire in the evening. After we passed the confluence of the White Rivers the stream of the Yukon River flows much faster. The breathtaking White River valley shows us the endless wide of the land. The Yukon River now spreads into a large river with several wide arms and hundreds of islands. We use this opportunity to explore some of the smaller channels and we might have the chance to see some wildlife close by. After 17 days on the Teslin and Yukon River we notice the first signs of modern gold mining techniques. For us a sign that we reached the Klondike goldfields and we will arrive in Dawson City today. Arrived in Dawson, we stay for the next three nights at the Dawson City River Hostel. Take your time to explore the former gold mining town of Dawson City and its historic and lovingly restored buildings. We suggest you visit the gold digger museum or the original cabin of Jack London or just sit in Klondike Kates and have a coffee. In the evening we will see the nightlife of Dawson and visit the legendary Diamond Tooth Gerties Casino with its Can Can Show. On the way back to our camp we take a short drive to our viewpoint. 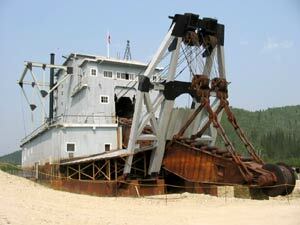 We will have an excellent overview and great photo opportunity of Dawson City and the surrounding Klondike goldfields. In the early morning we drive over the Klondike Highway back to Whitehorse and stop by at the lovingly designed Moose Creek Lodge and the Five Finger Rapids to take some more pictures. Arriving in Whitehorse we check in for the last night in our hotel. 2 full days in Dawson City incl. goldmine tour, etc.